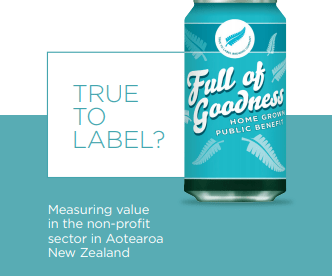 True to Label is a useful and timely research report looking at how value is measured in the non-profit sector in Aotearoa New Zealand. Written by John Page, a governance expert formerly of Sport New Zealand & now with BoardWorks International, it looks at 55 organisations including 15 sport and recreation bodies. Examining publicly available documents, True to Label asks how an interested party can tell what has been achieved using time and money provided by others and provides valuable insight into best practice. Don't miss this opportunity to learn valuable insights from this study and have your questions answered by author John Page. What John has done here is much needed and long overdue. This is an insightful study on a really challenging and important area of governance. It cuts to the core of organisations – namely why do they exist? What is their point and purpose, and how are they focusing on that and communicating to their stakeholders? True to label is essential for anyone in a governance or senior management capacity in the not-for-profit or public benefit entity sector in Aotearoa New Zealand. It’s a rigorous and objective study approached in a thoughtful, insightful and very practical manner." About the speaker: John has a long history in the not for profit world with 20 years plus experience as a manager and marketer in the performing arts across music, theatre, dance and festivals. For the past 13 -years he has led the Sport New Zealand governance programme. The ongoing development of the Nine Steps to Effective Governance framework and its associated resources during his tenure at Sport New Zealand are a benchmark in non-profit governance. John has recently joined BoardWorks International as a governance consultant.